Ok, so I don't know if it works, and I do feel sorry for the Nuevasync team. Still, I'm grateful for Google's Exchange ActiveSync service service. With MobileMe hopeless and near worthless, and my iPhone love broken-hearted, things were looking pretty damned bleak -- until today. Can I Still Sync with iTunes? No doubt about it. Google loves me. I ain't crawling back to Apple no more. Update: Google licensed ActiveSync from Microsoft for this. I assumed they'd cloned it. I wonder what a ten million user license of ActiveSync costs? I don't imagine Microsoft gave Google much of a discount. It's an amazing testimony to the power of Microsoft's Exchange monopoly, and a marker for how serious Google is about making this work. Update: It worked on our iPhone touch -- Calendar and contacts alike. I then wiped everything from the iTouch and proved I could sync just the calendar, and leave the contacts alone. That worked. Then I chose my sync calendars (config site is http://m.google.com/sync, you must visit it from an iPhone). I actually ran up against the 5 calendar limit (my work, emily calendar, my personal, MN Special Hockey and US Holidays), but that's good for now. The 5 calendar limit appers to be related to an iPhone bug. So next I will sync and backup my iPhone and create special backups of my OS X Address Book and Calendar. Then, for now, I will turn off Spanning Sync while I do my testing -- so OS X iCal will no longer be connected to my true calendar (no loss). Update: After backing up as above I'm on to my iPhone. It was already setup to do IMAP sync with my Gmail account; I added the Exchange server connection. I got the "invalid certificate" warning during Exchange setup -- that's a known bug. I turned Exchange Mail OFF, Contacts OFF (for now) and Calendars ON. I received the warning that existing calendars would be removed from my iphone. After setup my Mail, Contacts, Calendar settings showed two accounts: one for Mail and one for Calendars. Although NuevaSync recommends turning Time Zone support OFF for Calendars Google didn't make any recommendations, so I left it ON. I checked Calendar, and saw one calendar was synchronized. That was curious, since I'd configured the iTouch I'd specified 5 calendars. Here's where things get interesting. When I visited the setup page I found configurations for two devices. Anyway, so far it works. Update: This is so cool. I play around with an item time on my iPhone, and moments later it's switched on my wife's BB Pearl (yech) and her Google Apps Calendar (yay). I'm holding off on Contacts for now; the Google contact model is pretty sparse. I want to give that migration a bit of thought. With Google for Calendaring and soon for Contacts I can live with Todo.App, Notebook.app and Evernote for a while longer. Google has Gmail Tasks now. How long before they, or someone else, provides an iPhone Task app that will sync with Google Tasks? If they build out the data model I'd love to see Appigo selected for the iPhone app. 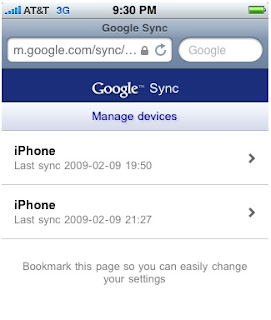 Update 2/10/09: Ok, maybe it wasn't a good idea to sync two iPhones to one account. When I go to http://m.google.com/sync I can't change which five calendars I sync to. Update 2/14/09: It may be coincidental, but a day or two after I discontinued sync with the 2nd iPhone I was again able to edit my subscription limit (still only 5 calendars pending bug fixes). Incidentally, now that I'm getting Push Calendar updates I see why people complain about the iPhone's battery life. OS X wasn't built to be a power miser. Update 5/22/09: Every few months the calendar seems to stop updating. I turn off "calendars" in the iPhone Exchange ActiveSync screen; that removes all calendars from the phone. Then I turn it on again. They then update normally.